A handcrafted piece of art, imbued with the spirit of giving. A simple but effective tool that helps children--and parents--get better sleep. An affordable, sustainable solution to Third World medical problems. These are the ideas that propelled three businesspeople to the top of the heap in the past year, earning them Entrepreneur® magazine's Entrepreneur of 2011 Awards. From thousands of entries, Entrepreneur editor-in-chief Amy C. Cosper and vice president of marketing Lisa Murray, along with The UPS Store's vice president of marketing Michelle Van Slyke and PR manager Becca Andrews Hogan, narrowed the field to 15 finalists. Readers voted on their favorites at Entrepreneur.com. And now, at last--here is who the judges and you, the readers, selected. Our Entrepreneur of 2011 is Lee Rhodes, founder of glassybaby. Her artisanal candleholders have struck a chord with consumers, starting in Seattle and expanding nationwide. And her mission of leveraging her success to ease the struggles of cancer patients makes her a rarity: a businessperson in both head and heart. Adam Nelson, our Emerging Entrepreneur of 2011, has leapt to the aid of sleep-deprived parents everywhere with the Good Nite Lite. A behavior-modification device that teaches children when to stay in bed and when to get up, Nelson's invention has captivated kids and captured the attention of medical and parenting experts who promote the health benefits of proper sleep. Finally, our College Entrepreneur of 2011, Gabrielle Palermo, is working with three of her fellow engineering students at Arizona State University on G3Box, a company that aims to transform abandoned or decommissioned shipping containers into portable medical clinics for use in developing countries and disaster zones. Their outstanding work represents the future of entrepreneurship: a winning combination of innovation, philanthropy and environmental responsibility. Adversity can spark great moments of clarity. It was during a difficult time for Lee Rhodes, founder of Seattle-based glassybaby, that inspiration struck for what would become a flourishing business. Glassybaby specializes in handblown glass votive candleholders produced in more than 400 rich colors. When Rhodes speaks of the "soul" of her candles and glass, it's not just smoke and mirrors. Subtle variations in shape, size and hue are testament to the artisanal quality of glassybaby's creations, each comprising three layers of glass and needing four glass blowers to produce. The product's roundness and heft--each weighs a pound--lend a tactile appeal. "You can feel the gorgeous color and the weight of truly handmade American craft," Rhodes says. The business was born in 1998, after her then-husband brought home a colored vessel he had made in a glass-blowing class. Rhodes, who was suffering from lung cancer, dropped in a candle and became mesmerized by the chromatic light. "In my mind, like the other treatments I did, it contributed to my healing," she recalls. "It makes you step back and relax and take a deep breath." Rhodes hired glass blowers and started giving away the votive holders; then, seeing their popularity, she began selling them out of her garage. 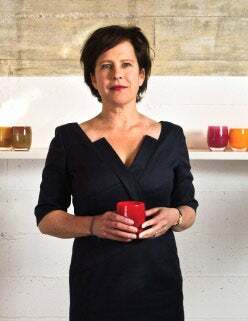 In 2003, she opened her first studio and retail space; the company later moved to its flagship in Seattle's Madrona neighborhood, where 70-plus glass blowers now produce 500 candleholders per day. Rhodes has two other stores in the Seattle area, one in New York's West Village and a thriving online presence. The votives, which sell for $40 each, are popular in restaurants, as "an individual piece of art on each table," Rhodes says. Additionally, she rents them out in large quantities for events. Glassybaby also has a version of its product for use as drinking glasses. Idol: Cancer patients everywhere who fight hard every day during their battles. Favorite websites: CoolHunting.com, Patagonia.com. "They promote their own things but also share stories of what's going on around the world. It's a wonderful, healthy retail experience." In 2011, Rhodes was honored with the "It's Always Something Award" from Gilda's Club New York City for her work to help cancer patients. The business keeps growing. In 2009, sales rose 25 percent; a year later, they were up 50 percent. For 2011, sales are projected to increase another 50 percent to $6 million. For Rhodes, more sales mean one thing: more giving. Glassybaby's philanthropic mission--donating a percentage of revenue (not profits), mainly to programs that help cancer patients with lifestyle requirements not covered by health insurance--was built into the business plan from the start. The company currently donates 7 percent of sales and aims to bring that figure to 10 percent. In total, glassybaby has contributed more than $650,000 to about 100 small and large organizations, including the Fred Hutchinson Cancer Research Center and the Memorial Sloan-Kettering Cancer Center, which has a "glassybaby fund." That spirit of giving has helped draw fans, including Amazon.com founder Jeff Bezos. He approached Rhodes in 2008--he must have the wrong number, she thought--and now owns 20 percent of glassybaby. Rhodes believes Bezos and others are drawn to what she calls "experiential retail": seeing the product made, knowing its story and the human element behind it. In Seattle, glassybaby is well-known, but in New York it's a different story. Sales in the store there, which opened in 2009, have been "disappointing," Rhodes admits, citing location, the lack of a studio where consumers can witness the glass-blowing process and the fact that New Yorkers, traveling by foot, don't wish to carry heavy items. However, the market has been "very lucrative" in terms of online sales, and Rhodes hopes to move to a new location in the city, with better foot traffic and a factory. Meanwhile, she has no plans to diversify her product line. "There's something to be said for sticking to what you're good at," she says. "We make one thing really, really well." For as long as parents have been having children, they've been trying to get their kids to sleep. 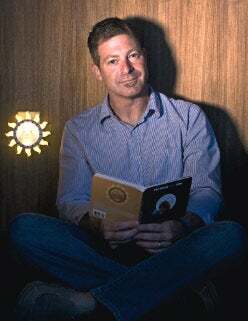 This universal problem sparked an idea in Adam Nelson, creator of the Good Nite Lite. It started "selfishly," says Nelson, who lives in Alpharetta, Ga. His 4-year-old son had gotten in the habit of waking each day at 5 a.m. and rousing the rest of the family, too. The sleep-deprived Nelson happened to catch a doctor on TV suggesting that parents use a timer to shut off night lights and help kids adjust to sleeping in a dark environment. "I thought, Why couldn't you turn it back on with the same timer?" recalls Nelson, who also believed it would "be neat to have one view for the child to know when it's time to rest and another view to know when it's time to get up. Really, that was the whole premise: A moon means rest time and a sun means wake-up time." A longtime entrepreneur who has worked extensively in software, technology and project management, Nelson turned to software developers he knew in Minsk, Belarus, to help design the product. He tested the prototype on his son, first programming the light to change from moon to sun at 5 a.m., when the child was accustomed to waking, then pushing it later by 10- or 15-minute increments each day. Inspired by: Randy Pausch, the cancer-stricken Carnegie Mellon professor whose book The Last Lecture discusses overcoming obstacles to achieve childhood dreams. Pleasantly surprised by: Customer testimonials of Good Nite Lite's benefits for autistic and deaf children, as well as seniors with dementia. Required reading: Entrepreneur.com, Jerry Weintraub's When I Stop Talking, You'll Know I'm Dead: Useful Stories from a Persuasive Man. Favorite gadgets: "I'm a big Mac fan--anything Apple." "It was classic conditioning," Nelson explains. "He was waiting for that sun to come on so he could come tell us it was time to get up." Soon, the boy learned to go back to sleep. "It taught him that when the moon's on, everybody's resting." Using his own funds, Nelson began manufacturing the lights in China. Frustrated by futile attempts to place the product at retail, he hired a PR firm, which scored a write-up in Parents magazine in November 2008. This led to immediate sales from his website. "We wound up selling thousands of units," he says. "There went the whole idea of 'retail first.' It wound up being 'consumer first.'" Now nearly 65 percent of sales are from GoodNiteLite.com, 25 percent from e-tailers such as Amazon and the rest from the 50 or so stores that have begun to carry the lights, including Learning Express. Nelson says sales, which have doubled each year since launch, were about $460,000 in 2010; he expects to top $1 million in 2012. He declines to disclose the cost of making his product, which retails for about $40 (or $34.99 plus shipping and handling from his website). Meanwhile, Nelson continues to adapt the product, often based on customer feedback. He absorbed the cost of upgrading his packaging from a "very wasteful" throwaway box to one that can double as a travel case or a stand so the light can be used on a dresser. In addition to working on iPhone and iPad apps, he is experimenting with different sizes and styles of the physical light and is developing a series of children's books to go with it. Nelson, whose motto in business has always been "fail quick, fail cheap," is elated by Good Nite Lite's success. "It was a big gamble," he says,"but one that worked." Two professors at Arizona State University posed a challenge to their engineering students: Come up with a function for the numerous used shipping containers abandoned at ports around the world. For Gabrielle Palermo and three of her classmates, crafting a solution to this problem has evolved into not only a compelling model of adaptive reuse, but possibly a lifelong career. From the roots of that classroom project, Palermo, a junior studying biomedical engineering, and her partners--mechanical engineering senior Billy Walters and mechanical engineering master's students Susanna Young and Clay Tyler--have started G3Box, a company that aims to convert the deserted or decommissioned steel containers into medical clinics that can be deployed around the world. Many companies use shipping containers that end up languishing at their end locations due to the high cost of returning them to their points of origin. Palermo says the team's thinking immediately turned to ways to convert the containers into something that could help people. Young and Tyler began working with the idea of turning the 160- or 320-square-foot containers into maternity clinics for use in developing countries with high maternal mortality rates. Palermo and Walters, meanwhile, had been working with Payson, Ariz.-based disaster-relief organization Telehelp on improving container clinics that had been deployed in Haiti after the 2010 earthquake but were found to have insufficient insulation and ventilation. The four students came together to form G3Box--the name comes from "generating global good"--with the idea of designing their own clinics and selling them to nonprofits and nongovernmental organizations. Goal: "To help as many people as possible." Required reading: Eric Ries' The Lean Startup and Deborah Cadbury's Chocolate Wars. Travel plans: After the first G3Box is deployed in Kenya, the company hopes to move into India. The modular, mobile medical units--outfitted with ventilation, insulation, power, potable water and any other services a customer might request--can be used by hospitals or organizations that would like to expand existing facilities, or can be easily transported to disaster zones for use as temporary clinics. G3Box plans to function as a hybrid for-profit company and nonprofit foundation. The students have raised $4,000 from ASU's Innovation Challenge and another $10,000 in seed funding from the school's Edson Student Entrepreneur Initiative. The team is working on a prototype maternity clinic, in a container donated by Swift Transportation, and hopes to deploy it this summer in Kenya, as part of a partnership with Boulder, Colo.-based nonprofit Sustainable Resources. With the $5,000 in prize money from the Entrepreneur of 2011 Awards, the students hope to obtain their second container and build a prototype disaster-relief clinic. "We feel that medical clinics are the biggest need right now," Palermo says, adding that the containers could eventually be used for "any type of social work around the world: classrooms, food distribution units, dental offices--basically anything someone wants." The containers, which cost $12,000 to $18,000 to build (the high end of the range includes solar panels), will initially be constructed in the U.S. and delivered to areas of need, but the hope is to eventually have assembly sites near international ports, particularly in Africa. For Palermo, what started as a student project has the potential to turn into a dream job. "When I started college I didn't really think I was going to be growing a business," she says. "Doing G3Box for my future career or starting up other companies that focus on social good is my passion now."